Please note: This festival also takes place on Sunday, March 20, 10 am-5 pm. Admire the exquisite imperial eggs and other fanciful Fabergé creations collected by Marjorie Post. Experience festive folk music performaed by Samovar Russian Folk Music Ensemble and spirited dancing by Kalinka Dance Ensemble. Enjoy stories of Russian Easter traditions in a fun family play, produced by Happenstance Theater. Take part in a traditional Russian egg-rolling game. 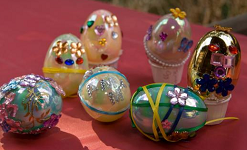 Step into Fabergé's Workshop to decorate your own Fabergé-inspired egg. This family festival is funded in part by the Bonnie Mapelli Youth Education Fund. All of Hillwood's 2016 festivals are supported by a grant from the Sally Foss and James Scott Hill Foundation.